We’re packing for our RTW trip as full-time nomads. 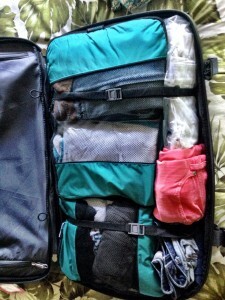 This post is about getting real with one main suitcase for the next two years. Can I do it? 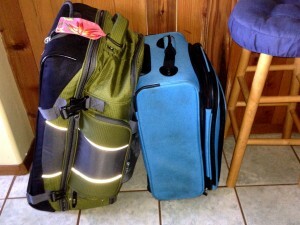 Background: It was helpful before we began packing for our RTW trip that we had downsizing experience. We combined two households when we married, and then transitioned from a large house to a smaller townhouse. Then we sold everything and moved to a tropical island. None of it was easy. It is amazing the attachments we make with stuff! Professional organizers will tell you to sort: keep, sell, donate, or trash. With the Kauai move, we had more decisions to make: keep and take, keep and store, sell, donate, dispense to family (keepsakes), trash. The whole downsizing process took us a year. If that seems daunting as you start, keep your eye on the prize. In our case, the prize was paradise. Packing for our RTW trip is upping the downsizing ante. We’ll be completely nomadic with no home base to return to, much less store stuff. Even though we arrived with very few possessions, and have been living a far more minimized life, this coming RTW trip is the big kahuna. We’ve already donated a surprising amount of clothing. Pete has been selling things on Craigslist and in our 2 Year Around the World Adventure Sale page. Since we’re giving up our furnished rental here, everything in it that’s ours has to go someplace else. 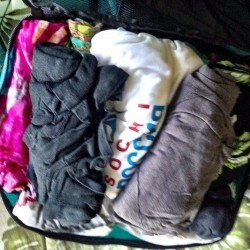 The suitcase dilemma: Earlier this year, we spent 5 weeks in Europe and Russia. We’d each purchased this American Tourister suitcase, the “Splash” 21 inch upright roller, anticipating we’d be carry-on only people. Reality check: this suitcase exceeded size specifications on European budget carriers (and now United Airlines) so we were forced to check our bags. By the end of the trip we were so tired of schlepping, we willingly checked. 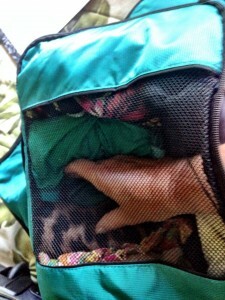 Even with such a small bag, I found I had overpacked; I could have easily done with about 25% less clothing. 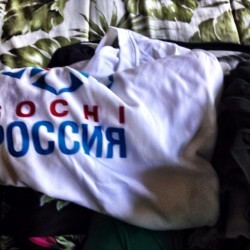 I gave away a lot of stuff to a new friend in Russia to lighten the return load. 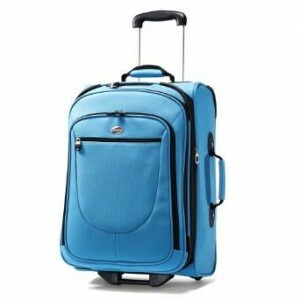 What I did like about this suitcase was the color, easy to spot in a sea of black, and the exterior compartments. If I get tired of carrying extra stuff around in 5 weeks, how am I going to feel after two years? We decided we’d pre-pack and live with a reduced wardrobe over our last few weeks here on the island, to get as minimalist as we could. So far, I haven’t felt deprived, but I’ll admit to boredom. 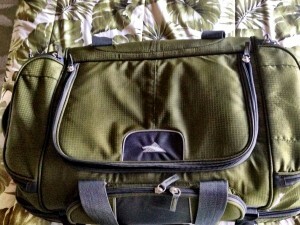 After downsizing from the first pre-pack’s even larger roller duffel (which we’ve already sold, so no pic), I got my second pre-pack into this green one. I like this green duffle (here’s a similar one) because the fabric is heavy duty, and it has a couple more exterior zipped pockets. 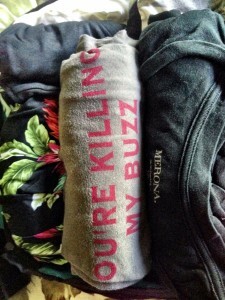 Otherwise, the concept is sort of the same as the larger duffel I’d started with. There are two sections that are independent of each other, yet accessible via interior zipper. This means if you’re on the go and somewhat organized, you’re not rooting around through your entire belongings. The downside to this green monster: he will not stand upright on his own, but needs to lean. The big guy needs to lean – cue Bill Withers? And even only half-packed, he weighed a lot. Hello, overage charges? Gah!!! I don’t think so. And here we are today. three pairs of jeans, rolled (denim, white – in a clear space bag, and a fashion color worthy of Nathan Lane in The Bird Cage). Update: okay, stop the insanity. Only denim comes along. 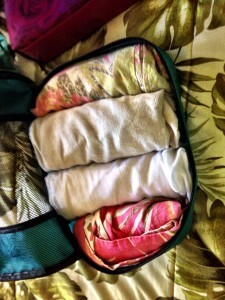 I’m a huge fan of packing cubes, and I use several different kinds. I rarely wear the short sleeve t-shirts on Kauai – too hot! – but for now, they’re coming along. You can fit a lot of stuff! 6 solid v-neck 3/4 sleeve T’s: wht, turq, red, blue, brown, black – these are my cooler weather go-to’s, good alone or under a cardigan or jacket (in clear recycled zip case from a set of bedsheets) Update: the three that are crossed out? Kaput! 1 heavier black waterfall cardigan out! 1 l/s t-shirt, purple out! 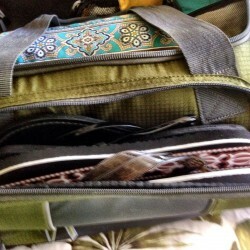 With a little bit of repositioning, the bottom half of the duffle is organized and closes easily. 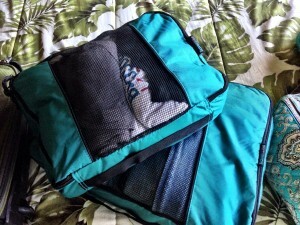 The top half of the duffle must hold the remainder of the clothing I anticipated taking, and a foldable cosmetic organizer (Vera Bradley – great design, here’s a similar one), shoes and incidentals I don’t want to carry on. 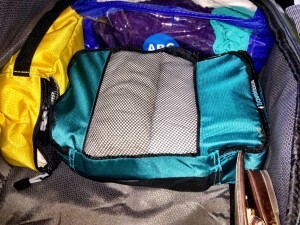 Narrow packing cubes – brilliant! Frankly, this was worrying me. 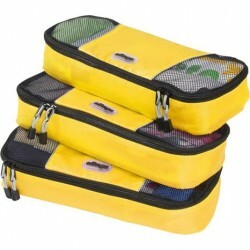 For this section I’m using narrow e-bags packing cubes (set of three, in yellow), the small packing cube from the teal 3-piece set above, and a variety of recycled zip cases from cosmetic giveaways and other packaging. The cool thing about the packing cubes and other containers is that you can reposition multiple items at a time without having to refold. So with a few changes, everything above fit with room to spare. I added 4 bras, 3 pairs of slippers (flip-flop sandals for you non-Hawaiians) and a bag of assorted greeting cards and stationery, thinking it would be fun for recipients to get snail mail from foreign lands. There is still room in the top of the duffle, even after all this! Thoughts: This is still a lot of stuff. A real minimalist would laugh, but we’ll be gone for two years! If I haven’t worn something in six months, it’ll get left behind. We don’t want to be purchasing clothing regularly. We’ll be traveling much more slowly, so I’m hoping the schlep part won’t be as much of a pain. We’re each taking a bag for technology/business and a second item (which I’m going to call my purse) as carry-ons. In a future post, we’ll talk about that. Note: product links to Amazon in this post are affiliate links, which means we’ll gratefully earn a small commission should you purchase via our click. A warm bed and hot shower are yours for the asking at our house. Safe travels. My husband and I have spent the summer downsizing to move into a smaller place. That has been difficult enough. I can’t imagine downsizing to one suitcase for two years. It sounds as if you have it well in hand though. The fact that you don’t need winter things helps. No bulky sweaters. I always find it easier to pack light when going to warm climates. Enjoy your RTW adventure. Aloha Donna – Yes, if we needed winter things, it would be a different story. Aren’t you glad you’re downsizing, even though it’s a lot of work? It feels so liberating to be free of the weight of our stuff! Gosh Betsy, you look super organised! 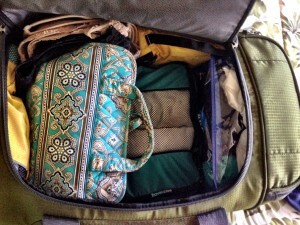 I love seeing what other people pack for a trip, and you have shown me that I need to cut down! 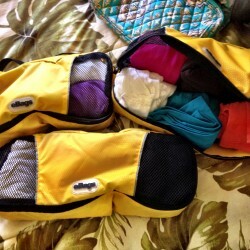 Aloha Johanna – Yep, we’ve had to be organized. There’s no do-over this time! I’m still thinking of what to take out of this suitcase, and there will be more that doesn’t come along. What an amazing feat! 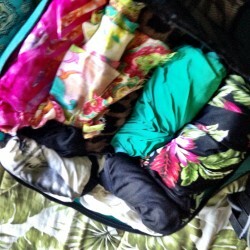 Which took longer…packing it or writing this wonderful post describing the experience? 🙂 Looking forward to reading more about your new adventure! I have found this to be a super inspiring post. My husband and I have recently moved house. It’s all quite exciting because we’ve bought something. OK, so it’s a really, really big object. Point is that we thought we would triage before getting here. But, somehow it didn’t happen. We have a long way to go, but judging by your post, there’s hope. Well done Betsy. If you get tired of wearing the same old shirt, buy yourself a new one somewhere along the road and toss the old one. We have photos from a cross country road trip we took in 2011 and it turned out to be much colder than we ever anticipated so pretty much in every picture I’m wearing the same sweatshirt. Who cares, right? We’ve also down 2 “major” downsizes in our lives. It really is freeing! Safe travels! Aloha Leyla – I’m sure you’re right. I’m obviously not in backpacking mode here and don’t plan to be, but still more stuff has got to go! I could be wrong, Betsy but it seems like a lot of extra clothing you are taking. What a task, huh? I can’t imagine packing for 2 years. I was so bored with my clothes after 2 months spent backpacking that I wanted to throw my k-way (remember those) in the ocean! Aloha Jane – I hear you on boredom. My sweet spot is a few more things than I’ve given myself to wear in these last few weeks. I don’t want to be down to so few items that I’m tempted to purchase more! We’ve been traveling full time for six years now, but it’s not really like packing when you’re on a motorhome. Have a great time! I am so impressed with your decisions. You did a great job of figuring out what you will need and packing. I love eBays packing cubes too. They make it so much easier to pack as well as find things without rummaging through everything. I’m excited for you to be making such a wonderful journey! Aloha Marilyn – Thank you so much! A little bit more on the kaput list, and things will be good to go, I’m thinking. bon voyage! I have a suitcase that is very much like yours in color and design and I do indeed love it. But 2 years of living with it–I don’t know! Thanks for the detailed article. How much does your bag weigh? Oh, gosh, Marianne, I haven’t dared weigh it yet. It does “feel” significantly lighter than the 60 lb shipment we sent back to the mainland today. But without getting rid of more stuff, I’m not going to worry about the number yet. First—I learned a new word –pareo. Then I realized I actually had bought one in some other lifetime, but I could never figure out how to wear it as more than a shawl. How many ways do you wear yours? We’ve also downsized twice–and I count as a 3rd time, this year when we had to clear out our closets for subletters. I traveled for four and a half months with a 22 inch suitcase. My husband was in awe of how much I fit into it. 3 months of the time was in an apartment in Honolulu..
You are wise to travel slowly. Packing and unpacking gets old really fast. I feel like a packing Luddite because I’ve never used cubes. I find that if I tie down my clothes, they come out almost like they’ve been ironed. The downside is having to rummage to find things. We will be taking two trips this fall–one of 10 days to Europe and one of 3 weeks to Africa. I don’t quite have my head around the packing yet. We keep threatening to get new suitcases. We bought our current ones at the Sharper Image — from before they went bankrupt. They’ve been great, but age is catching up with them. I recently acquired a 20 inch Eagle Creek suitcase, but it’s probably magical thinking to think that’s going to be big enough. BTW, I have a large suitcase which I used to store clothes that weren’t coming on our 4 month trip. We’ve been home since May 20th and it remains packed. I’m thinking that if I’ve managed this long with whatever it contains, it can all probably be jettisoned and the earth will not stop spinning on its access. Is it hard to leave Paradise or are you ready to move on? I’m looking forward to reading along! Aloha Suzanne – most people use the pareo as a coverup, tied above the bustline, or as a skirt. The younger girls here tuck theirs up to make a short strapless dress with a blouson effect. I’ve been keeping certain of the cubes packed in the drawer. Nice organizer there, too. The 20″ would never work for me as an only suitcase for a trip of that length. I wish I could use the turq suitcase because I like it, but the large packing cube takes up almost the whole thing. This was so much fun to read, Betsy! I love nitty-gritty pieces like this that describe what travel is really like. Hopefully I’ll be putting your experience and insights to use someday! You are an impressive traveler! I did not know about the cubes, love that idea. I always take too much. I don’t think I could go two years in one suitcase. However, if the weather is always warm then maybe I could. I would love to see your itinerary! 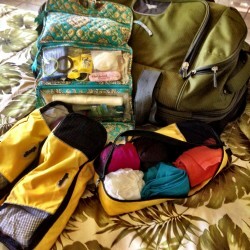 We’ve spent 2 years on the road and I know what a daunting task it can be to pack and plan for what you need when taking off on the initial leg of a big trip. Looks like you’ve addressed the first priority (to us anyway) which is all about ORGANIZATION and how to find (and keep track of) what you’ve packed! 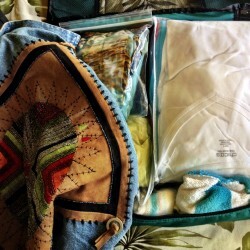 We use a combination of packing cubes, compression bags and plain old ziplocks as we pack and unpack in each place and it’s so much better when you unpack one thing to find what you need versus the whole darn suitcase! Can’t wait to read more of your posts! Aloha Anita – I feel validated! LOL I know there’s a certain point you reach where you have to say, I’ve done my best to plan and now let’s get on with it. If I’ve made mistakes, we’ll deal with them. Thanks. Hats off to you for having what I would consider a varied wardrobe in the bags you’ll be carrying. Life without baggage can be so simple. On the other hand I had an interior designer friend who packed 14 bags (not a typo)to move back and forth between Australia and Canada. I can’t even imagine the cost. Aloha Leigh – Thank you so much. I’m trying not to be so minimalist that I will feel deprived. Everyone has a different threshold, but 14 bags? Wow! We see so many examples of how that doesn’t work here on Kauai. One listing we saw before we moved offered an entire household’s worth of furniture, art, kitchenware, dishes and stuff down to washcloths and pantry staples for $5000. Beautiful antiques and quality items. It had cost her $15,000 to ship it all two years earlier. It was then that we decided we’d get rid of as much stuff on the mainland as possible. Still, we had 9 tupperware bins of household, winter clothes we needed for a trip, etc. I’m proud that only 3 are going back to the mainland – the same winter clothes (after we did a reacquisition cost analysis) and office records. It still seems like a lot. We sent two back yesterday and I’m putting last minute things in the third. It was probably cheaper for your friend to pay airline baggage fees than ship them. Wow, you are so organized! I’m a pretty minimalist traveller but I have never tried packing cubes. Think I should give them a try. I really admire what you are doing and look forward to reading about your RTW adventure. Aloha Kay – LOL I know what you mean on all counts. I try hard not to overpack, but I still do. 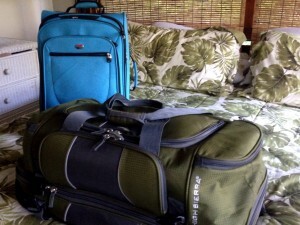 And we were amazed at how much stuff we accumulated during our time here on Kauai. At least we are only sending 3 boxes back to the mainland. Vigilance! Wow-you definitely inspired me. We are in the midst of house downsizing now and I was amazed at your FB page you ran. It’s overwhelming at times, but each session feels so freeing when I spend a couple of hours at it. My biggest problem with the travel would be boredom too. You’ll have to get some scarves along the way to brighten things up and add some flash, cheap and easy to do. It will be great fun to watch your adventure!